Is your documentation everything it should be? Are your physicians providing all the information your coders need for accurate coding and reimbursement? Will the information be good enough when ICD-10 is implemented? Has your budget prevented you from enlisting help from a top-shelf consultant’s clinical documentation improvement (CDI) program? There is a viable solution. Just ask the HIM department at Monroe Clinic, part of an integrated clinic-hospital organization licensed as a 100-bed hospital with an 80-provider multispecialty clinic in Monroe, Wis., and 11 community clinics in southwest Wisconsin and northwest Illinois. Regardless of a facility’s size, several issues are crucial for all HIM departments. Monroe’s HIM department has the same needs and concerns as the largest university or national medical conglomerates: good documentation, ongoing communication with physicians, improved coding, and a positive response to a staggering number of industry changes. Laurie Schimek, RHIT, Monroe’s HIM manager and privacy officer, says it was a whirlwind experience as the clinic attempted to take better control of its documentation practices. By addressing its needs one step at a time, Monroe has been able to keep on top of healthcare’s shifting landscape. 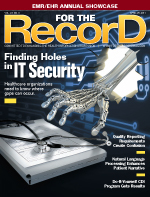 In 2009, after converting its coding from paper documentation to a new EMR, Monroe began discussing ways to improve physician documentation in the new system. By keeping the immediate task at hand manageable, Monroe forged ahead toward its ultimate goal. Schimek says the idea was to create a peer relationship with the physician staff. It turned out to be beneficial for both sides, a positive experience that offered assistance to physicians as well as to the coding department. Schimek says several strategies were employed to create this cooperative effort. In addition to these behavior changes, Monroe’s CDI coders created personal business cards and bumped their dress code up a notch to reflect their competence as clinical professionals. “You can’t let clothing cause you to be prejudged,” Schimek notes. Rather than try to tackle everything at once, the CDI program focused on each department’s top five issues and required that a coder was available for 15 minutes at regular department meetings. As documentation needed clarification, coders jotted down the basic issues daily. At each meeting, the top five reoccurring items were brought to the attention of physicians and staff. As the physicians became more attentive to the most pressing problems, new ones were introduced. Arrangements were made for a coder to participate in daily rounds, and the medical staff’s demand for her input quickly increased as more departments opted into the program. One skilled coder representative soon became several with a little time and training. Eventually, the program expanded to address outpatient clinic needs as well as inpatient concerns. One step on a tentative path, created by need and fueled by a coder champion with little nerve and built on a foundation of good planning and cooperation, has brought significantly more to the clinic than some basic documentation improvement. Letters of commendation from the hospitalists to the chief medical officer further validated the project’s value and gained esteem for the coders and the department as a whole. Meanwhile, case mix has improved noticeably. Trepidation surrounding recovery audit contractor audits has subsided thanks to the improvement in specific and detailed documentation. The thought of a new ICD-10 coding system and its expectations for greater documentation detail is less intimidating. In addition to those benefits, the program has enhanced employee satisfaction, an important accomplishment in an environment where there is increased demand for competent coders. In fact, the project’s original coder champion has been promoted to coding supervisor. “Our confidence levels have improved noticeably all around. As awareness of the knowledge and capability of the coding staff spreads even wider, their self-esteem and respectability continue to increase along with their reputation,” Schimek says. If you’d like to learn more about the Monroe Clinic CDI program, visit www.monroeclinic.org or contact Laurie Schimek at laurie.schimek@monroeclinic.org or 608-324-2192.